Lt. Riley and Maj. Carey joined senior conservation officers from around the country for the NACLEC leadership academy in April 2016. In April 2016, the S.C. Department of Natural Resources' (SCDNR) Lt. D.J. Riley and Maj. Mark Carey participated in a two-week leadership academy sponsored by the National Association of Conservation Law Enforcement Chiefs (NACLEC). 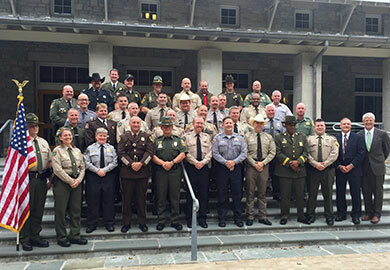 They were joined by 34 other senior conservation officers representing 29 states and focused on topics such as leading change, shaping organizational culture, critical incident management, and strategic planning. Earlier this month, Lt. Riley and Maj. Carey gathered with members of the International Conservation Chiefs Academy (ICCA) in Washington D.C. and worked alongside counterparts from 11 countries including Africa. The goal was to build relationships and gain knowledge in combating illegal wildlife trafficking. "As stewards of our natural resources, this was a great opportunity for South Carolina to have a seat at the table and to be represented at this national event," Lt. Riley said. A panel discussion was hosted at the National Geographic headquarters to promote awareness of the effects of poaching and wildlife trafficking, and SCDNR had the opportunity to discuss South Carolina state efforts with the U.S. Wildlife Trafficking Alliance (USWTA). USWTA discussed its efforts regarding working with non-government organizations like eBay, Tiffany's and Royal Caribbean to educate customers about illegal wildlife trafficking in hopes of stopping the demand for animals that are obtained illegally. "We don't deal with elephant ivory or rhino horns here in South Carolina," Lt. Riley stated. "But we deal with poachers who illegally take game, fish, reptiles and plants from our natural resources for monetary gain. That, in turn, affects our ecosystem and all of the citizens of our state." According to Lt. Riley and Maj. Carey, the experience gained them both a lot of knowledge and they plan to incorporate what they learned into properly policing poaching and wildlife trafficking in the Palmetto State.